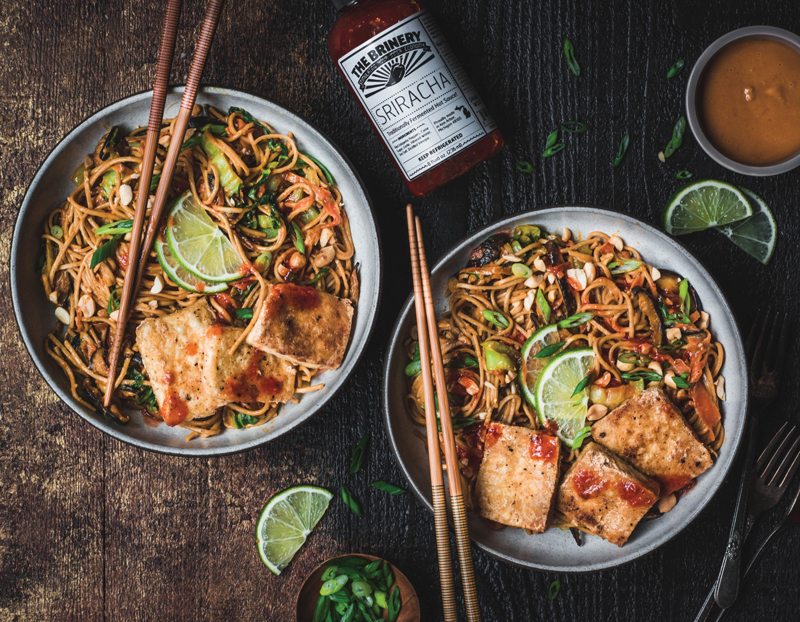 The Featured Ingredient: The Brinery Sriracha sauce fuses red jalapenos with garlic, cane sugar, sea salt, and vinegar for a fiery punch of flavor. Visit thebrinery.com for stores. In the ongoing quest for guilt-free alternatives to carb-y, starch-y pasta dishes, Lexi Harrison and Beth Sinclair draw inspiration from Japan with their take on a soba noodle dish. The bouncy buckwheat noodles are drenched in a peanut sauce featuring Sriracha made by Ann Arbor-based fermentation brand, The Brinery. “As longtime fans of The Brinery products, we were excited to use their Sriracha in this dish,” Harrison says. “It tastes so fresh and has a satisfying kick.” Topped with crispy tofu, the healthy plate makes for a hearty meal. Combine all ingredients for spicy peanut sauce in a blender — except water — and blend well. Add water, starting with ¼ cup, to thin out. Add more as needed. You can also simply whisk all ingredients together or use an immersion blender. Cook soba noodles according to the package directions. After draining the noodles, be sure to rinse in cold water to stop cooking. Set aside. Meanwhile, heat sesame oil in a sauté pan. To shred carrot, use a vegetable peeler to make long, thin “noodles,” which will hold up better in the dish. Add carrot and mushrooms to the pan and sauté about 5 minutes. Add bok choy and continue to sauté until tender. Add in cooked soba noodles and peanut sauce and use tongs to toss together. Drain tofu and pat dry with paper towel. If you have the time, wrap tofu in a few sheets of paper towel, place a book or heavy object on top, and let drain for 30 minutes-1 hour to remove as much moisture as possible. Slice tofu into evenly sized cubes, then transfer to a plastic bag or bowl. Add flour, salt, and pepper and shake bag to coat tofu evenly. Heat oil in a large sauté pan to medium high. Add tofu and let cook on each side (without stirring) for about 3 minutes or until golden brown. Cook on all sides, or until most pieces are completely crispy. Remove from heat and quickly transfer to a cooling rack placed over a paper towel-lined baking sheet. Assemble bowls and garnish with green onion, chopped peanuts, fresh lime, and more Sriracha. For more recipes from Harrison and Sinclair, visit crowdedkitchen.com. Content provided for Hour Detroit’s ongoing Local Flavor series is not influenced by Harrison and Sinclair’s business partnership with local brands.